by Rhode Island School of Design students and hung in the Electron Movers' gallery at 128 North Main Street in Providence, Rhode Island. The intent of the photography show was humor, but the meaning of the exhibition was misconstrued by powerful Providence citizens -- who hadn't seen the show -- and a police raid was the result. The night before the opening, a policeman was sent to evaluate the show and, finding nothing wrong with its content, informed Laurie McDonald and the Electron Movers that a police raid was planned for the next day. 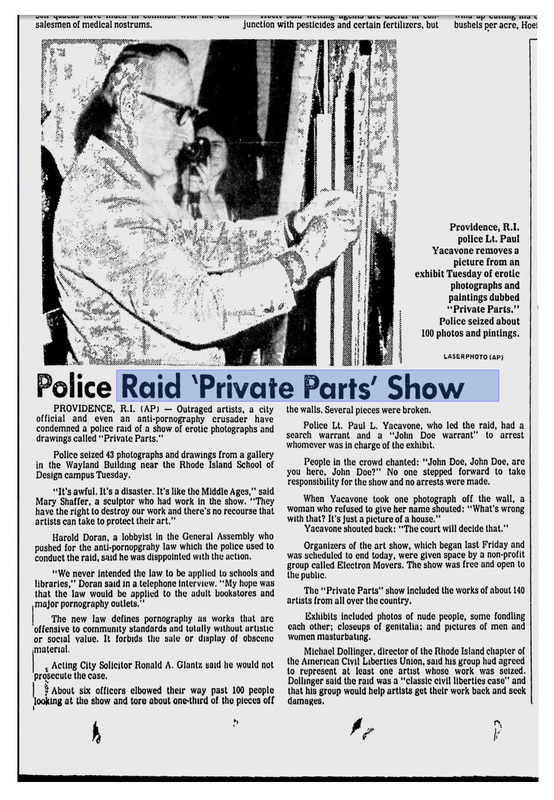 Anticipating the raid, RISD students requested that a lawyer be present for the opening, the American Civil Liberties Union was notified, and Laurie prepared to record the atrocity. On May 15, 1978, the day of the opening, a notice of the show appeared in the Providence Journal and hundreds of citizens climbed the six floors of cast iron steps in the former Fain Carpet Building to see what all the fuss was about. Other citizens -- again, who hadn't seen the show -- attempted to challenge the tax-exempt status of the Rhode Island School of Design, and a local senator championed the show by stating, on the radio, that he was glad the Sistine Chapel was not located in Providence because citizens would try to revoke the tax exempt status of The Vatican. Local politicians and the police themselves believed that the show was organized to challenge a tough obscenity law that coincidentally had taken effect only a few days prior to the opening. Of course, RISD students had no awareness of, or interest in, local politics. Work confiscated by the Providence police was never seen again, and it was alleged that the work was taken to police headquarters and destroyed. Fearing arrest, immediately after the raid members of The Electron Movers fled to New York City. A notice of the raid appeared in Newsweek magazine. "I was very excited (in a non-sexual way) to stumble across the video you did of the infamous 1978 Private Parts raid... It's a wonderful piece of (still relevant) history that you captured. As you know, the ACLU of Rhode Island was directly involved in defending the artists' First Amendment rights."